May 2, 2018 /0 Comments/in For Educators /by Darko S.
Children use their phones, browse the internet, and watch television from an early age. Although there are some benefits to that, there are also risks, like investing too much time in social media, video games, etc. This usually leads to their completely neglecting to read books, which are essential to their growth and development. 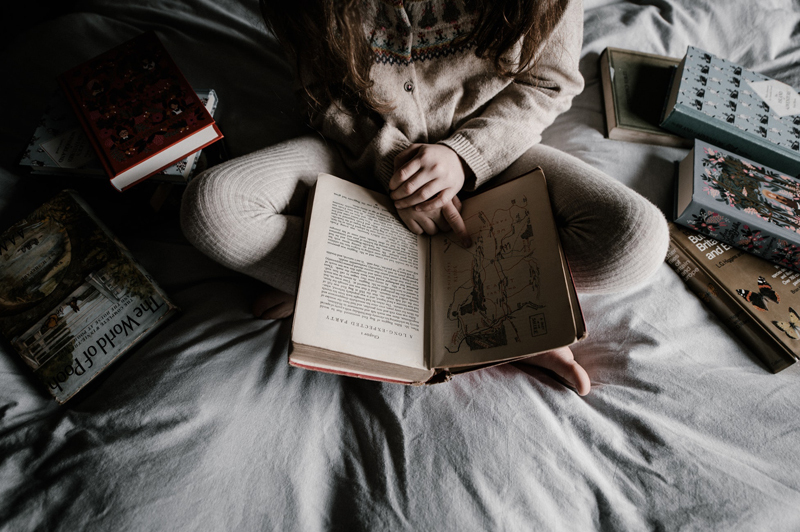 In this article, we’ll cover numerous reasons why reading books is so important, but also provide parents with advice on how to encourage reading from an early age. The most obvious reason why reading books is important is that it allows children to expand and enrich their vocabulary and develop literacy skills. By reading a book, children encounter phrases and words that are not frequently used in casual communication, which they’ll then be able to use themselves in conversation. Stories and situations in books are usually described vividly and in a lot of detail that helps with the understanding of complex and abstract concepts. It’s easier for a child to understand the concept of compassion when the feelings of a literary character are thoroughly described and some context is provided, rather than by simply reading the definition in a dictionary. This way, a child is re-living the character’s experience that’s making those concepts relatable, so they’re able to better comprehend them. Furthermore, younger children often read out loud, which helps them to learn the correct pronunciation of words. Most books comprise many different characters. In order to properly follow a storyline, children need to remember the characters (their names and characteristics) and learn to differentiate between them. Following and remembering a plot line is also important for understanding the story. By doing all of this, they’re sharpening their memory skills. Children will often want to recount interesting events from a book to their friends or parents, so they’ll try to recall the story correctly and tell it in coherent way. However, they may have difficulty remembering some important details from the story, so parents need to guide them by asking questions, and help them see the importance of this skill. This is another great way of developing a child’s memory from an early age. Good reading and memory skills enhance children’s confidence as they start school. Children who began reading at an early age will approach their new commitments at school with more ease and self-confidence and can be more enthusiastic when it comes to reading for book reports, etc. Every book is a world of its own. By reading a book, children encounter all sorts of new ideas, both realistic and unrealistic, magical and mythological, that help develop their imagination. They learn to differentiate between what’s real and what’s make-believe. They can envision new worlds and play with ideas, but also learn that they can think about something without having to actually look at it. They learn that with imagination they can reach much greater distances than by simply observing the physical world with their own eyes. Stimulating imagination further helps in developing creativity. Children often show this through their drawings, but it can also lead to the development of valuable skills later in life. Stories provide a great way for children to step into a literary character’s shoes and see things from a different perspective. This is important because it helps them understand a perspective that’s not their own and where the centre of the attention is not on them. At the same time, this practice teaches them to understand and share the feelings of other persons (i.e. empathy). Furthermore, going on a journey in someone else’s shoes is very beneficial when it comes to the regulation of their own emotions. If children are having problems, such as, for example, being unpopular at school, having anxiety when with a group of peers, etc., reading about similar experiences of someone else helps them have a better understanding of their own feelings, and feel a sense of relief that someone shares their problems. Or, if they have anticipatory anxiety about their first day at school, they can find a book that describes someone else’s pleasant experiences when going to school and see that their fear is not justified. To find out more about the benefits of reading, check out this guide from our friends at Mom Loves Best! – Read to your children at an early age. It’s an excellent way to bond and create memories your children will cherish for life. It’s a practice you should start when they’re very young, because it helps them develop a love for stories and books before they even learn to read. Make sure to encourage them to ask you to explain the meaning of a word if you stumble upon some they don’t yet understand. Hearing you read to them will enable them to hear the correct pronunciation of words and improve their verbal fluency. Continue reading to them even when they learn to read on their own. – Surround them with books. A stimulative environment has a great effect on children. Make sure to have a book collection appropriate to children their age in your home that they can easily pick up if they feel like reading. Also, get a library card you can use together, or get them one that they can use on their own. Ask your children about which books they’d like to read and help them look them up. It’s sometimes hard for children to find a book they’d like to read without someone’s help. Make a habit out of going to book fairs, where you can take the entire family and have lots of fun and at the same time fill your house with more books. – Be a role model. Chances are children will pick up a book as well if they see their parents reading often and enjoying it. Try talking to them about stories and books you’ve read about to raise their interest and tickle their imagination. We understand that sometimes it’s hard to get children interested in reading, especially if they’re fed up with classical literature from school. Luckily, there are some alternatives that might get them to love books and make the transition to classical literature a bit easier. – Audio books. If you can’t find the time to read to your kids very often, you should try playing them pre-recorded audio of you reading, or even try playing them audio books you can find online (check out the bottom of this article, where you can find some websites with free audio books for children). Audio books are a great way of engaging children in reading by taking some of the “pressure” off them if they are struggling. Some students need to have the audio content to follow along with the written content. – Comics/Graphic books. Comics are a great medium, especially for children who are just learning to read. You wouldn’t want to overwhelm them straight away with too many words and complex sentences. Instead, you should first get them interested in colorful books with lots of pictures or drawings. At the end of the article, we’ve provided a website where you can find some book recommendations for younger children. For slightly older kids, you have a wide variety of superhero comics, which they’ll most likely love. If you’re not familiar with comics, and aren’t sure which ones to get, you can go to a comic-book store and ask about some comics that are appropriate for your children’s age. If your children are struggling with language or reading, here at Nobel Coaching you can find many tutors who can help them. Also, be sure not to neglect negative feelings children tend to have about school, and, if necessary, think about reaching out to our coaches who can help your children discover their strengths and motivations, and build more positive feelings towards school, and ultimately reach their potential as students.